Five days of fun! The 6th Annual South Beach Seafood Festival is back to take over Miami in October on the sands of South Beach. This Florida seafood festival kicks off Miami’s globally-recognized stone crab season October 16-20, 2018 in the best way that South Beach knows how! Plus, ticket price includes all-day open bar! If you want to get your tickets go to sobeseafoodfest.com and use promo code CGLOVE for 20% OFF your ticket price. South Beach Seafood Festival is not your typical east coast seafood festival, but a high-end experience that showcases the talents of South Florida’s leading chefs and culinary masterminds via a diverse group of events where guests experience the best seafood in Miami. Saturday’s beachfront event, South Beach Seafood Festival spans five blocks and welcomes over 14,000 seafoodies to enjoy a day of fun in the sun. This seafood festival in Miami is only in year 6, and the fun is overwhelming, and the food is undeniably good. Festival ticket prices start at $45 and VIP is $150. General admission tickets are $45. On Saturday, October 20, 2018, get ready to indulge in the best seafood festival at pop up café’s from 22 hand selected leading restaurants. They’re showing off 70+ different mouthwatering eats from Florida’s freshest seafood in Miami. All these seafood dishes are paired with complimentary all-day open bar for everyone! Three (3) live music stages and endless interactive experiences top off why this is the best seafood festival. Guests should be ready to indulge with their toes in the sand! VIP Tickets are $150 and include everything listed for general admission tickets. Plus, check out the 1 ½ block VIP Experience! When you enter the VIP Hospitality Village, you get treated to the best of Miami in October! Get your tickets at sobeseafoodfest.com and use promo code CGLOVE for 20% OFF your ticket price. This is a VIP night for all true seafoodies! The ultimate VIP CHEF SHOWDOWN is the battle of all battles where the finest South Florida chefs take their chance at showing off the best seafood in Miami at 11th & Ocean Drive. 14 chefs are paired head to head creating 7 different seafood battles where guests #CHOOSEYOURCHAMP. Guests will visit different battle stations to sample and vote before the chefs from each battle take the GOYA Culinary Pavilion kitchen stage and a panel of judges along with the guests decide who holds the title in showcasing the best seafood in Miami. 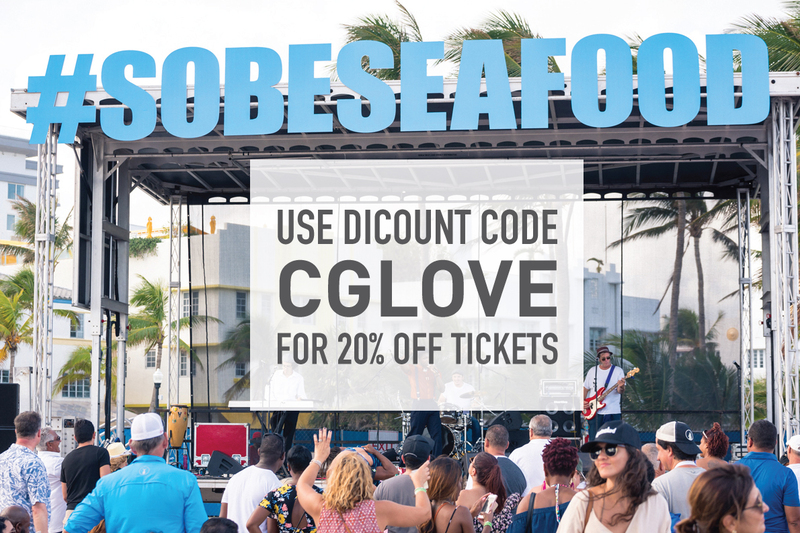 Get your tickets at sobeseafoodfest.com and use promo code CGLOVE for 20% OFF your ticket price. The event will also feature the 3rd Annual Brown Forman Cocktail Showdown, hosted inside Woodford’s Speak Easy, featuring 10 top competing bartenders in South Florida making ocean inspired cocktails and from last year, these were not your typical cocktails. The 2018 Battles will be revealed in September. The VIP Weekend Pass ticket is $250 and includes access to Friday, October 19th Chef Showdown and VIP access to Saturday October 20th’s South Beach Seafood Festival. Together, the restaurants will showcase an eating experience unlike any other, where the restaurants are serving you right on the sand – it’s four blocks of fun to be exact. Get your tickets go to sobeseafoodfest.com and use promo code CGLOVE for 20% OFF your ticket price.